Calling all food connoisseurs! 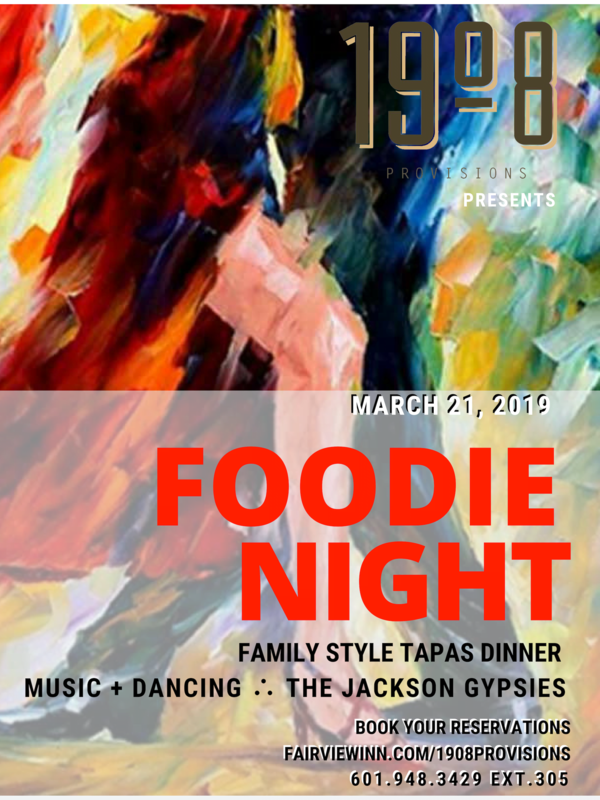 1908 Provisions is a premier, farm-to-table restaurant in Jackson, MS. Nestled in the downstairs of the historic Fairview Inn, make a reservation to experience the upscale yet casual ambiance, Southern-inspired cuisine, and artfully prepared libations. 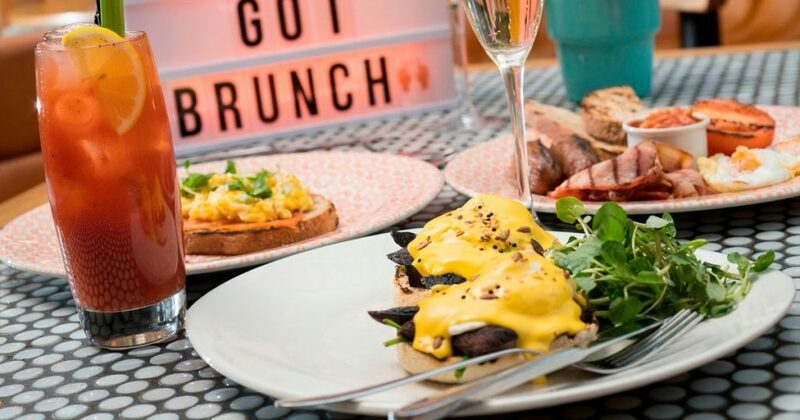 Whether you’re joining us for dinner or Sunday brunch, our fine dining establishment is just steps away from your accommodation and the perfect place to end your evening after exploring the historic Belhaven neighborhood. From the moment you’re seated to well after your final course, you’re sure to remember your time at 1908 Provisions! Whether you’re wishing to indulge in a hearty dinner portion or a savory brunch special, 1908 Provisions. Review our hours of operation, and make a reservation today! 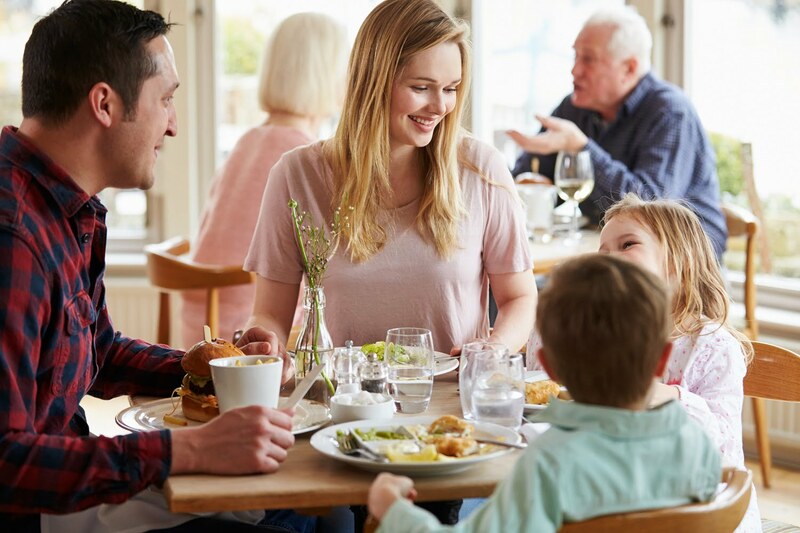 Dinner offered Monday through Friday | 5:00 p.m. – 9:30 p.m.
Brunch on Sunday only | 10:00 a.m. – 2:00 p.m.
Click here to book your Dinner reservations now! To uphold the quality of ingredients, 1908 Provisions boasts a menu of constantly changing, seasonal items for dinner and brunch. While many dishes rotate throughout the year, our visitors rave about the signature dishes of Stuffed Pork Tenderloin, 1908 Filet, Signature Redfish, our Simon's 1908 Burger (no other burger in the area can compete with this one! ), and our Mixed Grill (a local favorite!). If you wish to order a libation, ask your knowledgeable server for their recommendations for what will complement your meal. You’ll have the option to choose from a custom martini from our specialty martini bar, a glass of exquisite wine, or a craft beer from a local brewery. 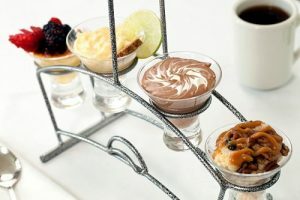 For your final course, peruse the robust dessert menu listing specialty creations of the chef such as the Chocolate Espresso Bread Pudding or our Apple Pie Tace. With a delicate balance of luxury, exceptional provisions, and inviting ambiance, you’ve found yourself in one of the most delightful restaurants in Jackson, MS! It's not truly Spring in Mississippi until the first pot of crawfish is ready and a local beer is poured. Saturday, April 13th, 4-7pm, outside on the deck and the adjoining Garden room, for those who want to enjoy some A/C! LIVE Music by local favorite, Bill and Temperance with Jeff Perkins; awesome drink specials; and more! Spend the afternoon soaking up some sun and livin' the good life with friends, a cold drink and everyone's favorite, deliciously spicy critter! 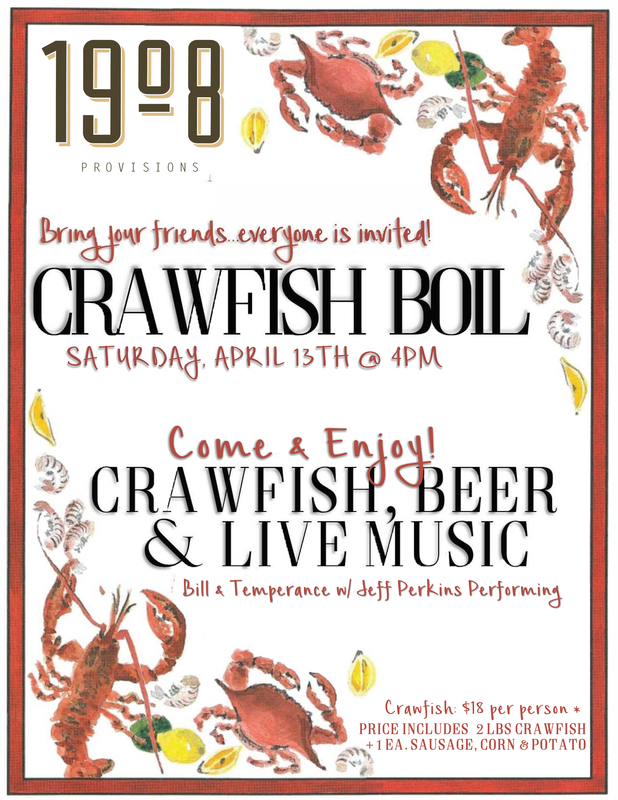 Join us as we kick off summer at 1908 Provisions' Crawfish Boil Pop-Up! April 13th - if you aren't there, we promise you'll wish you were! Reservations Strongly Encouraged to make sure you get your fill! Please click the link for "tickets" to reserve your table and crawfish! 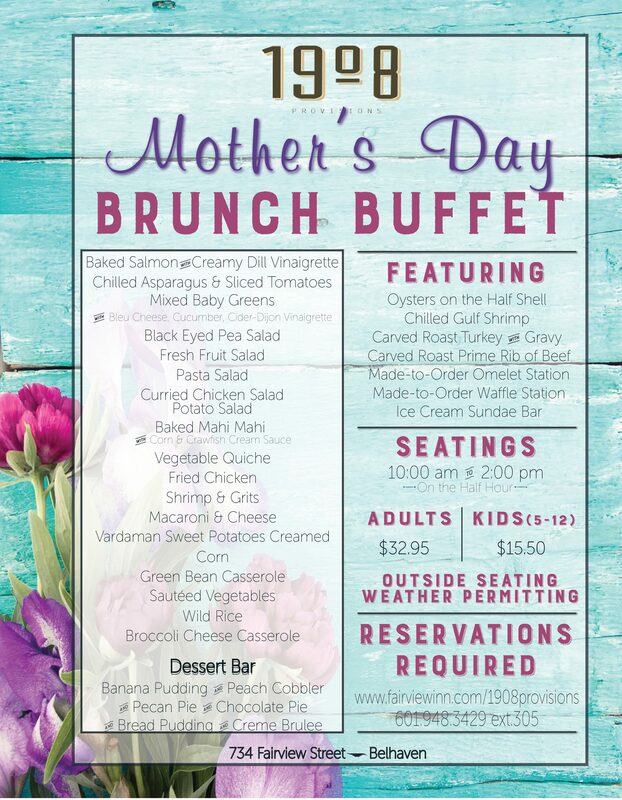 Please call 601.948.3429 ext.305 or click the button below to book online. Too excited to wait? Begin jammin' to Bill and Temperance with Jeff Perkins, NOW! Join us for dinner at 1908 Provisions! We will be offering a select menu between 5 - 6:00 pm every night. For $25.00, you receive your choice of either, an appetizer and an entree, or an entree and a dessert. Whether you have plans later on, or you just want to make it an early night, this offer is a guaranteed highlight of your night! This offer is valid for every night of service. Take a look at the delicious options we have for you on our NEW Early Bird Menu. You can also call us at 601.948.3429 ext.305. Space is limited and filling up fast! 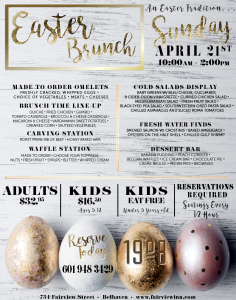 Reserve your table today! Reservations are required. 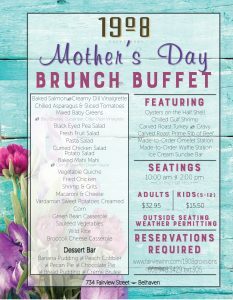 Please call 601.948.3429 ext.305 or click the button below to book online. Mom's the Word, Sunday, May 12th! Notice: The restaurant does not take reservations on Saturdays for dinner. In that case, relax in the literary elegance of the Library Lounge. You'll find a healthy variety of both hot and cold small plates, created by the same farm to table based chef and kitchen staff as 1908. An informal nightlife destination, the Library Lounge invites you to be inspired Mississippi's authors and the experience where literary excellence meets local charm. Our in-house eatery offers a lavish selection of artfully prepared cocktails, all named after some of the most beloved Mississippi authors. Book a delicious stay in one of the luxurious guest rooms at Fairview Inn! Reserve your table for dinner or Sunday Brunch to discover what sets 1908 Provisions apart from other restaurants in Jackson, MS. In line with our vision, our fine dining establishment maintains the hospitality of Fairview Inn while catering to the needs of our guests. You’ll be treated to a laidback atmosphere, friendly staff, and gourmet cuisine, all paired with our meticulous customer service and the utmost luxury to create an unforgettable dining experience. Corey Ellison, the Executive Chef of 1908 Provisions, prepares all meals with only the freshest ingredients, the majority of which are locally sourced to ensure the highest quality. Ellison is gifted with the art of cooking and crafts specialty dishes, all boasting a unique and diverse flavor profile. Ellison is a born and raised Jackson area native. 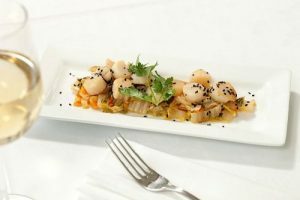 Using her natural, culinary talents she produces food unmistakably created by a chef who not only takes pride in her own work, but aims to show all her guests why she is so proud or be part of a local business, supplied by local vendors!